This article presents only online commercial tools that can be used to facilitate Agile retrospectives, as we have already produce a list of free retrospective tools for distributed Scrum teams. We mention only tools that have features specifically dedicated to Scrum retrospectives. If you want to add a tool that fits these requirements to this article, just let us now using the contact form. 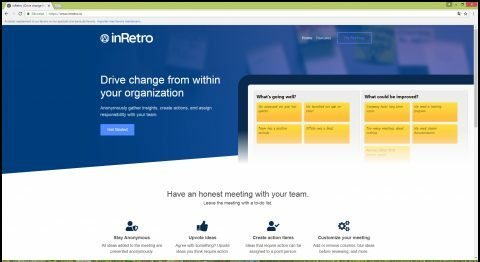 inRetro is an online tool that allows to anonymously gather insights, create actions, and assign responsibility with your Scrum team. All ideas added to the meeting are presented anonymously and you can upvote ideas you think require action. You can create action items that can be assigned to a point person. 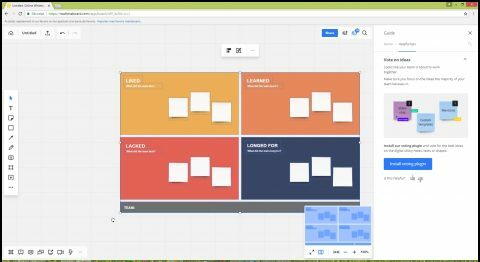 RealtimeBoard aims to provide engaging collaboration for distributed and co-located teams regardless of locations and time zones. There are many preset retrospectives formats like “start/stop/continue” or the 4L (liked/learned/lacked/longed for). You can vote on ideas with a special plugin. The tool offers also other features besides retrospectives, like story mapping or UX research (customer journey map). You can create and discuss anything together just like you are in one meeting room standing in front of a whiteboard. You can invite people through email or slack. There is an unlimited free version with limited features up to 3 teams members. When you signup, you are automatically placed in a free trial plan and your first 30 days of using Retrium are free. You start by creating a list of what went well (or not). Then you can group the items and vote for them. Finally, it is time to create some action list for improvement. 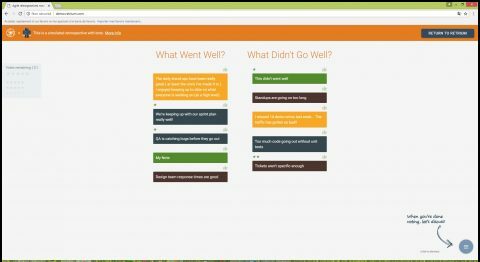 Retrospectus is an online tool to give and receive feedback among team members. It helps you visualize what made participants happy, confused or sad. There is an unlimited free version with limited features up to 3 teams members. You have to login with another id (github, google, facebook or twitter). TeamRetro is an enterprise-ready online agile retrospective meeting tool for agile coaches, scrum-masters and teams. Retrospectives can follow multiple formats (Start Stop Continue, Anchors & Engines, Starfish, Mad Sad Glad, 4Ls). It offers many different ways to invite members to retrospectives. All your actions are created in a single list that you can track from meeting to meeting. Team members get a gentle reminder before actions are due. Tick off completed tasks and show some love at your next retro. The trial period is based on 3 retrospectives.